The following strategy was released in December 2016 by the Executive Office of the President along with the National Electric Grid Security and Resilience Action Plan. This Joint United States-Canada Electric Grid Security and Resilience Strategy (Strategy) is a collaborative effort between the Federal Governments of the United States and Canada and is intended to strengthen the security and resilience of the U.S. and Canadian electric grid from all adversarial, technological, and natural hazards and threats. The Strategy addresses the vulnerabilities of the two countries’ respective and shared electric grid infrastructure, not only as an energy security concern, but for reasons of national security. This joint Strategy relies on the existing strong bilateral collaboration between the United States and Canada, and reflects a joint commitment to enhance a shared approach to risk management for the electric grid. It also articulates a common vision of the future electric grid that depends on effective and expanded collaboration among those who own, operate, protect, and rely on the electric grid. Because the electric grid is complex, vital to the functioning of modern society, and dependent on other infrastructure for its function, the United States and Canada developed the Strategy under the shared principle that security and resilience require increasingly collaborative efforts and shared approaches to risk management. The Strategy envisions a secure and resilient electric grid that is able to withstand hazards and recover efficiently from disruptions. In pursuit of this goal, the Strategy organizes joint approaches to protect today’s electric grid, manage contingencies by enhancing response and recovery capabilities, and cultivate a more secure and resilient future electric grid. As an expression of shared intent and approach, the Strategy organizes joint efforts to manage current and future security challenges. •• Protect Today’s Electric Grid and Enhance Preparedness: A secure and resilient electric grid that protects system assets and critical functions and is able to withstand and recover rapidly from disruptions is a priority for the governments of both the United States and Canada. •• Manage Contingencies and Enhance Response and Recovery Efforts: The Strategy sets out a shared approach for enhancing continuity and response capabilities, supporting mutual aid arrangements such as cyber mutual assistance across a diverse set of stakeholders, understanding interdependencies, and expanding available tools for recovery and rebuilding. 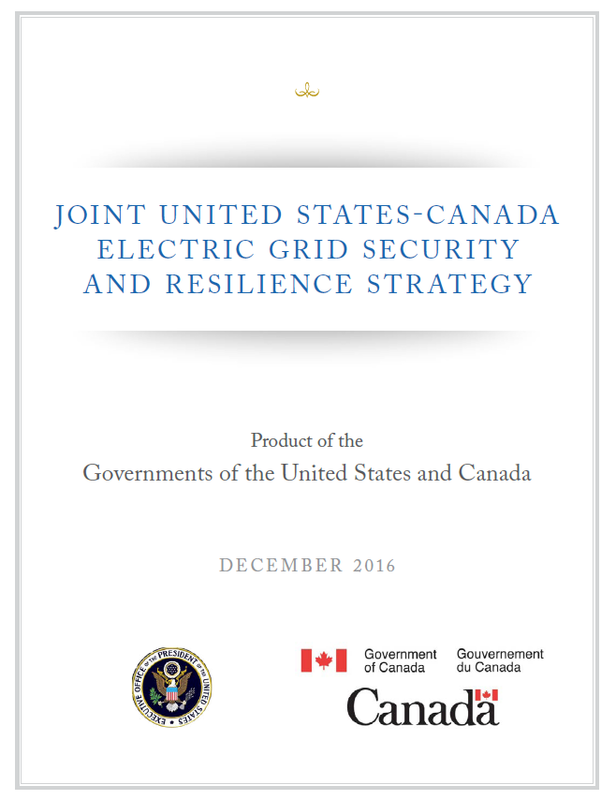 •• Build a More Secure and Resilient Future Electric Grid: The United States and Canada are working to build a more secure and resilient electric grid that is responsive to a variety of threats, hazards, and vulnerabilities. To achieve this, the electric grid will need to be more flexible and agile, with an architecture into which new technologies may be readily incorporated. The Strategy will be implemented in accordance with forthcoming U.S. and Canadian Action Plans, which will each detail specific steps and milestones for achieving the Strategy’s goals within their respective countries. These documents are intended to guide future activity within areas of Federal jurisdiction, with full respect for the different jurisdictional authorities in both countries. The Strategy is not intended to, nor does it, create any binding obligations under international law. Implementation will occur in consultation with state and provincial governments, regulators, and utilities, where applicable, and will require the sustained, coordinated, and complementary efforts of individuals and groups from both countries, including many who contributed to the development of the Strategy, such as private sector partners, policy makers, and the public. The two countries’ common effort to strengthen the security and resilience of the electric grid is imperative for both governments and all who depend on this critical asset.